The monumental statue of the Bavaria, accompanied by a lion, was revealed in a pompous ceremony in the year 1850. About 18m in height, it is the largest cast bronze statue of the modern age. More than 150 years later a comprehensive restoration became necessary, so for the first time in over a century the Bavaria could again be examined up close from a scaffold. 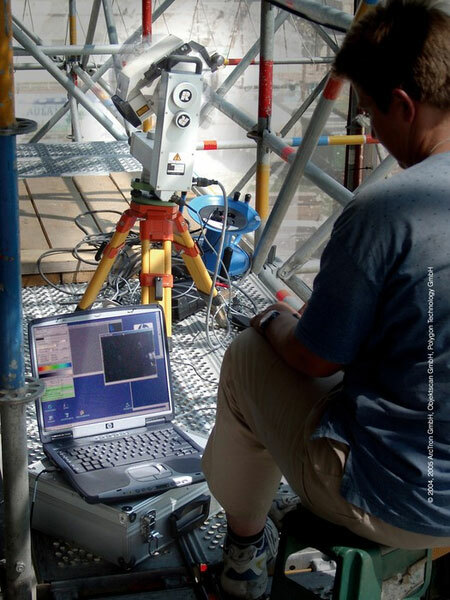 In order to seize this unique opportunity for scientists, restorers and the interested public, the Free State of Bavaria commissioned a photorealistic 3D-survey of the statue. The project was managed by the construction department of the Bavarian Administration of State Palaces, Gardens and Lakes and carried out by the Munich State Building Department, was launched in 2002 with financial support from the German Foundation for Monument Preservation. We collaborated with the engineering office of Dr. Konig, which is also specialized in 3D surveying, along with the 3D-software developer Polymetric, to design a data recording and evaluation concept. It ranged from a basic 3D-survey, to the construction of an information system, and finally a multimedia data presentation. The elaborate work on this complicated and groundbreaking project was successfully concluded in late 2004. 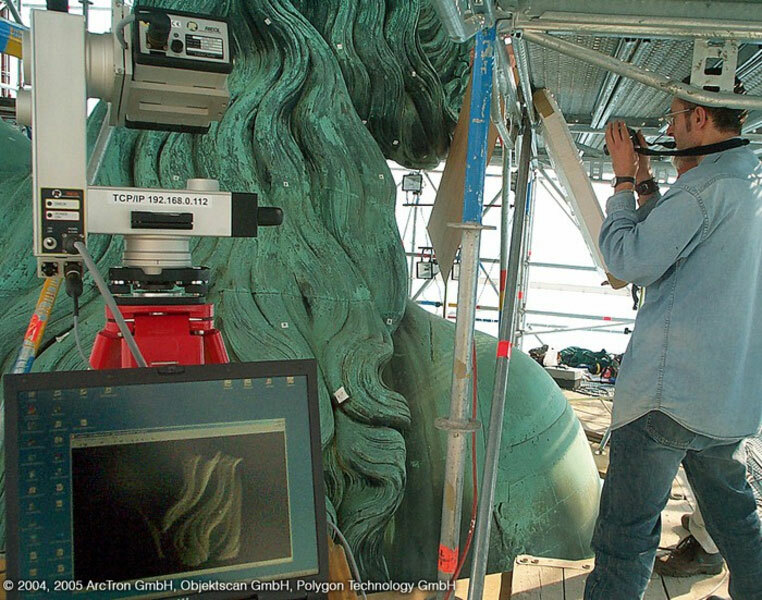 The first step was to use the latest, at the time, in survey technologies (3D-laser and structured light scanners) in order to record a highly precise model of the bronze statue accurate to within a millimetre. 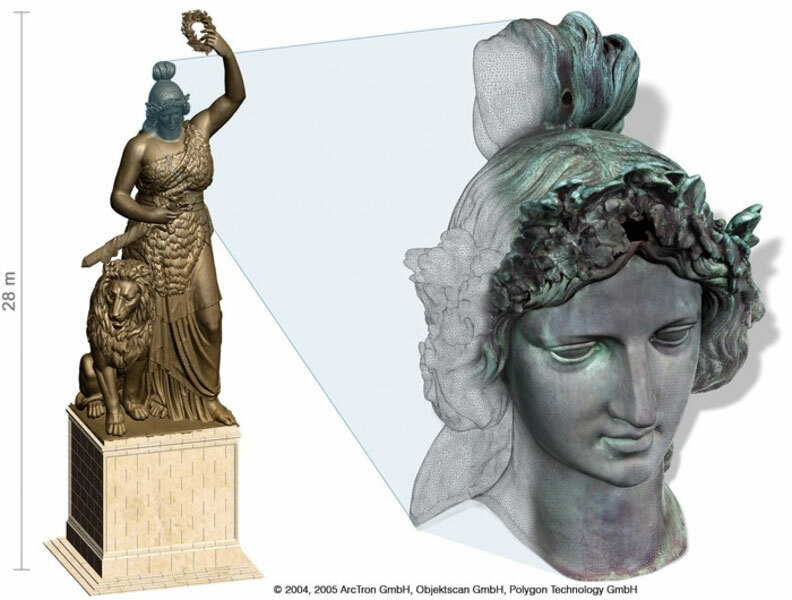 In a second elaborate step – which can be described as pioneering work because of the 12 billion 3D-survey points utilized – the 3D model of the statue was rendered by high powered computers in Regensburg and Potsdam. The software, developed by the Fraunhofer Institute for Graphic Data Processing (IGD) in Darmstadt, had to be able to create a very accurate and optimised 3D-mesh with photorealistic texturing. Divided up into the single cast segments and several levels of detail, the Bavaria can now be studied in full detail by computer. With the building of scaled 3D-models through rapid-prototyping arise new possibilities for exhibitions, museums and marketing. In the end, hundreds of single examinations and damage mapping for the ongoing rehabilitation process could be managed in a specially developed 3D-information system by ArcTron. The whole project was conditioned for a multimedia DVD-presentation and was published along with the monographical publication of the project.